The NOVUS-MT is a powerful and flexible real time transcoding solution supporting MPEG-2 and MPEG-4 AVC video codecs and a wide variety of audio codecs. It is ideally suited for any content repurposing, edge transcoding, or video distribution network bandwidth optimization application. NOVUS-MT has been designed to meet the demanding requirements of the IPTV, professional broadcast, enterprise video delivery, and streaming video markets. The scalable and cost effective modular design is capable of simultaneously transcoding up to four High Definion or Standard Definition video services. If desired, up to three units (12 transcoding channels) can be installed in a 1RU rack mount tray. Using NOVUS-TM’s unique transcoding architecture, operators can transcode multiple HD and SD services in a compact modular unit. NOVUS-MT multistandard broadcast transcoder is equipped with the latest advances in video compression technology to deliver excellent video quality at low bitrates. State of the art video processing combined with unique encoding technology enables new open system architectures to be created. Simultaneous support of DVB-ASI, broadcast video over IP, RTMP and HTTP Live Streaming allows content to be freely distributed over virtually any video network. Multi-Standard transcoder (MPEG-2 and H.264), with support for both SD and HD content. Up to 4 simultaneous transcoding channels: MPEG-2 to H.264; H.264 to MPEG-2; HD and SD support. 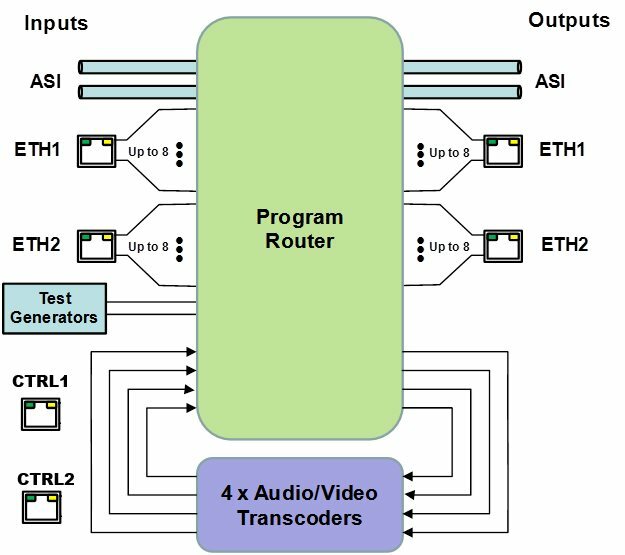 Audio transcoding support: MPEG-1 Layer II, AAC-LC and Dolby AC-3 inputs; MPEG-1 Layer II and AAC-LC outputs. 2 ASI input ports and 2 ASI output ports. All ports support the full ASI line rate of 213 Mb/s. 2 Ethernet ports with 100/1000 Mb/s support. UDP/RTP (unicast/multicast) support for Ethernet transmission/reception. UDP/RTP (unicast/multicast), RTMP, HLS support for Ethernet transmission. Internal program replication – individual programs can be routed to multiple outputs. Internal MPTS (Multi-Program Transport Stream) multiplexing and demultiplexing. (P)SI parsing and generation; ATSC table parsing. MPTS to SPTS Splitting support.